Source: Reading Body Works, Inc. The custom Classic series service body, model 132ABDW, features exterior storage compartments with an open cargo area. The bodies can be customized in many ways. Grip N' Glide drawers can be installed in several compartments. The drawer units are for storage of smaller parts, and utilize a J-latch system, which allows the user to open and close the drawer with one hand. 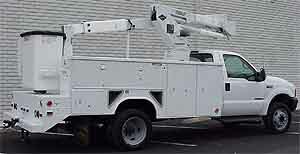 Other options include lighted compartments for interior illumination, aluminum chock block holders and an aluminum recessed fuel fill box (Aluma-Fill) that not only accents the vehicle, but will not rust after repeated use, and deck plating on the top of the compartments for added strength and slip resistance. The driver side full-length compartment with the access door at the rear, typically known as a hot stick box, serves as storage for sign poles and other long materials and tools. Other features include a grab handle and a cable stirrup at the rear partition and masterlocking, which locks all side compartments simultaneously to save time and keep contents safe and secure. A platform extension with a thru box can store long handled tools such as shovels, and a receiver mounted pintle/ball can also be added to the truck. Standard features include construction of two-sided A60 galvannealed steel and Lectro-Life immersion priming for complete rust protection. Other standard features include automotive-quality rotary locks for secure protection to tools and equipment, stainless steel bolt-on hinges, keeping the compartment doors operating smoothly in all weather conditions, and double paneled compartment doors offering greater durability. Reading Body Works, Inc., PO Box 650, Reading, PA 19611. Tel: 610-7753301; Fax: 610-775-3261.